While I love the look of this stitch, I have yet to use it in a project; all those extra strands of yarn tend to get in my way and I usually end up with more stitches on my needles than I am supposed to have. I even had to restart this sample piece a few times. The key, I think, is just taking your time and paying attention to what you are doing. Once I slowed down, I was finally able to get it right. Don't get me wrong, this is not a hard stitch to master, you just need to pay attention. In the video below, I demonstrate Row 3, in which you are making the YO and Row 4, in which you drop all of the YO. I hope this is helpful. Enjoy! I used this pattern for a scarf! Dropping the yarn overs really cut down my knitting time, and the scarf came out super soft and stretchy! I used a really chunky blend on larger needles (forgot the size), and it turned out great! Thanks so much for posting this on your youtube channel!! I have went through a good 20 videos and this will be the only one that actually helped me understand what it was that I needed to do. I am new to knitting, only been doing it for a month and I love it, it's something that I wanted to learn for a long time. you my dear have taught me a new pattern in the most easiest way someone can teach it, I thank you! Am new to knitting and i like this pattern very much think i will try it next. Do u think it could work for making a scarf? Yes, I think it would be great for a scarf! Easy but not for beginners. Easy to do the stitch, but you have to pay attention and you can lose your place if not careful! I am using this in a sleeveless tank top. I've added selvage stitches for the seams, so that I am not attempting to sew the long thready unwrapped stitches. This is a comfortable easy open stitch, looser than all the lace stitches currently in vogue, though I like those too. I used this stitch as a beginner and it was not difficult. I jumped in and tried a lot of advanced stitches and techniques as a beginner and many I had little or no trouble with. I personally don't think that there is anything holding a beginner back from any more advanced stitches other than seeing the skill level written on many patterns... sure you might need to be a little more focused on more difficult patterns but that is true for even experienced knitters. I found your method a lot easier for me to follow. I love this new stitch look forward to many more new ideas. Thank you. Hi, I'm about to create a scarf very similar to yours using two different colored yarns. What method do you recommend for switching out colors for a long scarf? -- cutting yarn after weaving or carrying up the yarn? 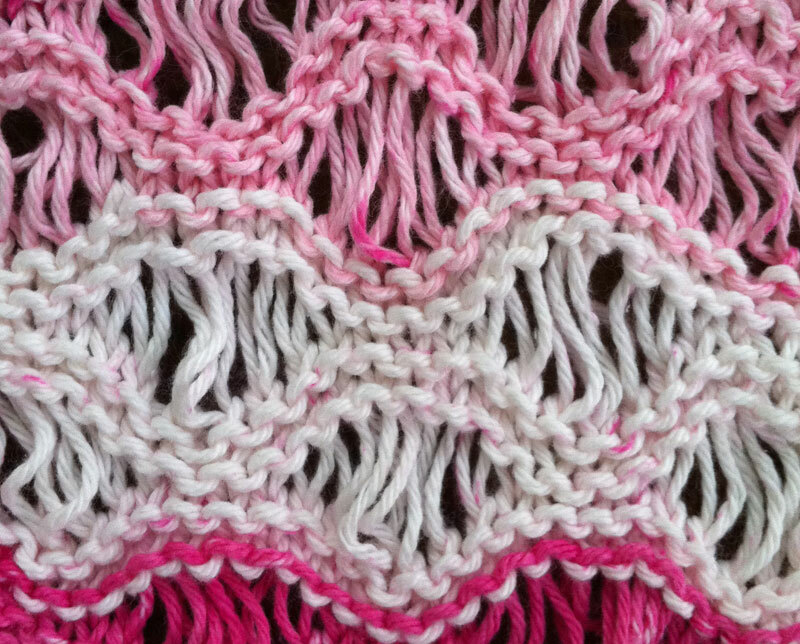 There's a scarf pattern that uses this stitch exclusively. I started it twice but didn't like how the wrapped stitches looked--they middle ones were droopy and distorted. So, I started a third time and changed the yarn overs from 2,3,4,3,2 to 1,2,3,2,1 and it looked ever so much neater. What needle size did you use and what was your gauge? Babycloud, I do not recall what needle size I used, and I didn't check my gauge on the swatch. I am not a garment designer so can't be if much help. 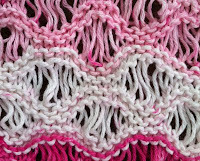 At any rate, you need to make a gauge swatch with the yarn and needles you plan to use for your pullover. Everyone knits differently even with the same yarn and needles so you need to determine your own gauge. You may want to take a sweater class on Craftsy or a design class, or get The Knitters Handy Book of Patterns to help you in making your pullover. Good luck!